On one of the side streets (Guldenhoofdstraat) that leads to Grand Place it is the small museum of chocolate, on its name: Museum of Cocoa and Chocolate or Choco – Story. Museum of Cocoa and Chocolate was founded by two families passionate about chocolate in 1998. In 2013 the museum had around 60,000 visitors. For adults, the entry to the museum is 6 euros. If you plan to visit it while you are in Brussels check their website to find all the necessary information. Besides visiting the museum, you will see a demonstration – how to make pralines – and you can taste different types of chocolate. 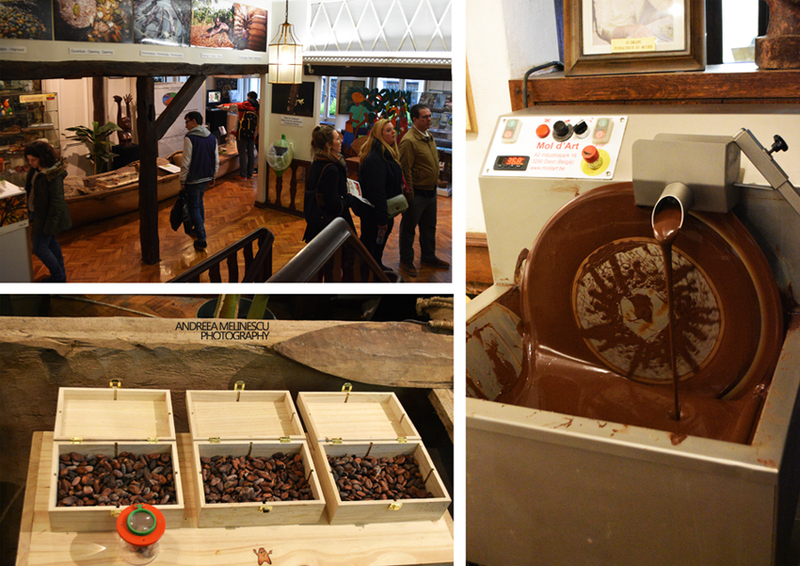 The museum is quite small, but interesting, with all sorts of objects from countries that produce cocoa fruits. You will see the Manneken Pis sculpted in chocolate. In terms of tasting, you will love those biscuits that you will put in the melt chocolate, you will love the fresh pralines, which will melt in your hand and if your taste buds will help you, you can learn to distinguish between four types of chocolate – white chocolate, milk chocolate, 54% black chocolate and 90% black chocolate, plus you can taste the cocoa butter. What I learned about chocolate? Olmec, Maya and Aztec civilizations are the first that cultivated cocoa trees in Central and South America. According to the faith of Aztecs, Quetzalcoatl, a god in the form of a feathered snake, was the one who brought the cocoa tree on Earth. In Europe the chocolate was brought by Christopher Columbus, in 1502, during his fourth journey. In 1518 Hernando Cortez used cocoa beans as currency. The first chocolate beverage was served by Montezuma, but the drink was not appreciated, being too spicy. Later it was adapted to European taste (added cane, vanilla, cinnamon) and it became popular in the Spanish colonies in the absence of beer and wine. Specifically, 1528 is the year in which chocolate „conquer” Spain. Anne of Austria, daughter of King Philip II of Spain, brought the chocolate in France in 1615. In Belgium chocolate first appeared in Ghent, in 1635. For example, in 2008 consumption of chocolate in kg/person was: Germany 11.39 kg/person, Switzerland 10.77 kg/person, UK 10.31 kg/person, Spain 3.30 kg/person, Japan 2.15 kg/person. Pralines were invented in Belgium in 1912 by pharmacist Jean Neuhaus. Neuhaus it is one of the most expensive chocolate chains from Europe and in February I plan to visit the factory shop in Brussels.